Monkey chow, mealworm mush, and predator popsicles, yum yum. 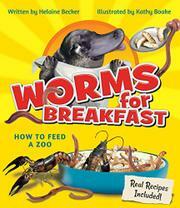 Here’s a lively introduction to the foods zoo and aquarium animals eat and some people who choose and prepare them. Becker opens her zoo cookery book with a recipe for an appetizer—platypus party mix (crayfish, earthworms, mealworms, and fly pupae, all live and wriggling—and a table of contents labeled “Menu.” Each double-page spread is a chapter. There’s a puzzle asking readers to match plated food with pictured animals and a spread describing a zoo kitchen. Further pages present additional surprising recipes, introductions to zoo nutritionists, and explanations of feeding methods—from formula for newborns to special treats for picky eaters—and parties, puzzles, and games mimicking feeding activities in the wild. The description of fish-feeding includes a shoutout to the Monterey Bay Aquarium’s seafood guide, and the author emphasizes the conservation mission of today’s zoos. Boake’s humorous computer-generated illustrations look like animal photos set on animation cels. One spread features seven nocturnal animals helping themselves to midnight snacks from the refrigerator. Superimposed on the final image of humans and the primates who are our relatives are suggestions for supporting animals inside and outside captivity.